You know those 5-things post going around Instagram? I did it then tagged Grace on Instagram. And then eventually she did it on her blog. And then she tagged me back, except on the blog this time instead of Instagram. And now I am doing it on my blog. And this is like the fourth time I've written that paragraph because it always ends up needlessly confusing. 2. That healthy food section is made up entirely of food eaten within the past 3 years. I did not eat any healthy food before the age of 25. 3. I would love to get a nose job. My family (my kids included) have these fantastic, perfect little noses. When I was 4 I fell down a concrete ramp. With my face. My nose is pretty messed up as a result. If you feel the bridge of my nose you can feel cartilage popped out of the left side and bent on the right. My nose is all helter skelter. Post injury. Also, pretty sure I'm currently rocking that same haircut. 4. Back when we were dating Aaron and I used to chat online most nights after work and school. I don't remember what we were talking about this one night but I said, "Deep down, I'm kind of scrubby." And he decided right then that he would marry me. 5. I'm a total baby person. I just want babies forever. With my sweet niece during their last visit. Do you see those rosy cheeks, chunky ankles, and that squishy baby bum?? That is my idea of heaven. Tagging Becca, Miss Nem, aaaand Nikki. You know, if you feel like it. I hear ya on the babies. I love babies. Toddlers are a little more intimidating to me. Also I feel like I should start trying that "scrubby" line out on guys I'm dating, though I think they pick up on it quickly when they realize I put on stretchy pants or sweats the minute I get home at night. I am digging your face in that post-injury photo. You have somewhat of a crazy look in your eye that says "that chocolate is mine." Love it. 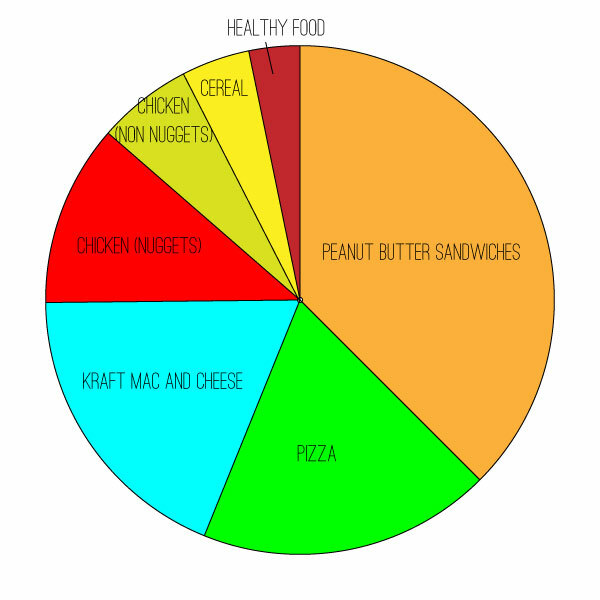 I just really love your pie chart.. Hahah. Also, I agree... Crunchy PB is the best. I've never noticed anything wrong with your nose. IT'S ALL IN YOUR HEAD. YOU DO NOT NEED A NOSE JOB. For real. I'd steal your face (face-off style) if that kind of stuff wasn't frowned upon. I hate that the squishy baby stage is so short. Mine is almost growing out of hers and it makes me want more and more babies. BABIES FOREVA. But my husband thinks two is enough so I'll have to savor these last few months of chubby cheeks. Also, I used to love crunchy peanut butter, then I discovered Trader Joe's sunflower nut butter and I'm now a convert. I can't go back to regular PB anymore. Ohhh, that sweet picture!! So precious. You have a pretty nose and gorgeous face!! You have a great nose - it may not be the same as what you were born with, but embrace the so-called imperfections! Easier said than done, obviously, but truth. I got a pixie cut last fall (first dramatic cut of my life), and until then I think I had spent my whole life with pretty much some form of my same haircut from childhood. okay I'm dying over that chart (and the little Kayla AND the snuggle pic) -- I was like -- "say WHAAAA" thought over the healthy food thing because ..... you are like the healthy food queen in my book -- thank you for clarifying.